Located in the heart of Tamworth, this luxury hotel is within a 10-minute walk of Powerhouse Motorcycle Museum and Australian Country Music Hall of Fame. Bicentennial Park and Tamworth Capitol Theatre are also within 1 mi (2 km). Tamworth Station is 21 minutes by foot. Situated in Tamworth, this motel is within a 5-minute walk of Powerhouse Motorcycle Museum and Australian Country Music Hall of Fame. Bicentennial Park and Tamworth Capitol Theatre are also within 1 mi (2 km). Tamworth Station is 19 minutes by foot. 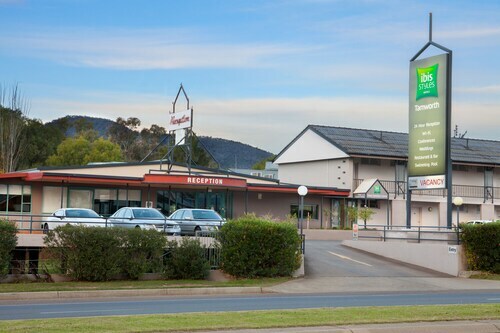 Located in the heart of Tamworth, this luxury hotel is within a 10-minute walk of Tamworth Capitol Theatre, Tamworth Power Station Museum, and Bicentennial Park. Australian Country Music Hall of Fame and Powerhouse Motorcycle Museum are also within 1 mi (2 km). Tamworth Station is 6 minutes by foot and West Tamworth Station is 23 minutes. 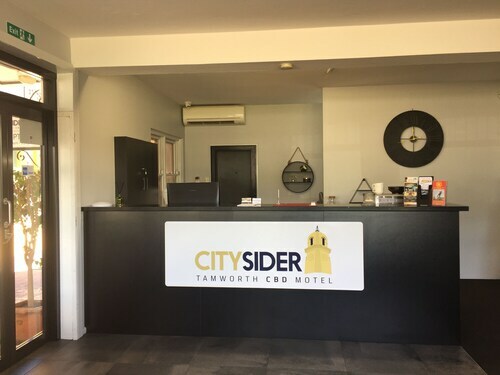 Located in the heart of Tamworth, this motel is within a 10-minute walk of Bicentennial Park and Tamworth Capitol Theatre. Powerhouse Motorcycle Museum and Australian Country Music Hall of Fame are also within 15 minutes. Tamworth Station is 11 minutes by foot. We’ve got two words for you: country music. Tamworth, NSW is known as the "Country Music Capital of Australia" thanks to its legendary annual festival and live music venues. But that’s not all Tamworth holidays are about. This town is filled with family fun, outdoor escapades and plenty of nightlife, so whenever you visit, you’re bound to have a toe-tapping good time. How do I get to Tamworth from the airport? There are daily flights into Tamworth Regional Airport from Brisbane and Sydney, and from there it’s a short 10km into town. To get around, you’ll probably want to book your own set of wheels through Wotif’s car hire options. In fact, wheels are a popular way to get here, too. It’s about a 6-hour drive from both Brisbane and Sydney, so pack up your cooler and get ready for the road trip of a lifetime. What are the most popular hotels in Tamworth? What kind of hotels are there in Tamworth? Tamworth hotels can be luxurious or practical, spacious or romantic, near it all or tucked away. Whatever you’re looking for, you’ll find it here. The Retreat at Froog-Moore Park is Tamworth’s only five-star hotel. This adults-only B&B won’t just pamper you with premium bedding and tons of complimentary touches—it will make sparks fly. Staying a while? Got a big group? The apartments at Quest Tamworth have everything you need for a home away from home, including full kitchens and up to three bedrooms. No kitchen, no problem at Best Western Sanctuary Inn. This downtown Tamworth hotel has the award-winning Lobby Restaurant right on the premises. Where should I stay if I’m visiting Tamworth? Travellers to Tamworth are as unique as the town itself. From road trippers to country music seekers, where to book your accommodation in Tamworth depends on what brought you here. Golden Guitar Motor Inn is near the town’s famous Golden Guitar, one of Australia’s “big things”, which attracts road trippers and selfie seekers from around the country. Next stop: Port Macquarie hotels to check out the Big Eight Ball! This area is great for those here to get their twang on during the Tamworth Country Music Festival, too. Studio 367 is a brand-new hotel near Tamworth Regional Entertainment Centre, the biggest venue of the festival. Get a good night’s sleep at Quality Hotel Powerhouse, far enough from the hustle and bustle to relax, yet close enough to have downtown at your fingertips. What are some things to do in Tamworth? The activities don’t stop outside of the festival season. From hiking to nightlife, there’s always something on. Ever high-fived a wallaby? You can at Marsupial Park! Strut with the peacocks, hand-feed baby kangaroos and more. This park is chockablock with “Aww!” moments. By night, take in dinner and a show at Wests Diggers Club. After your meal, get up and shake those hips to local country acts, use your brain during trivia night or play the pokies. You’ll never have to leave! Except to go back to your Tamworth accommodation, of course. Get cultured at the Capitol Theatre. Enjoy a drink at the bar before seeing anything from comedy acts to world-renowned plays like Wicked. Bring your sequins—this is the glamourous part of town. This Tamworth travel guide is just the beginning of all the adventure you’ll find in this NSW town. But before you can dance the night away, you need a place to hit the hay—and Wotif has the best deals around. Book your hotel today, and get to practicing those moves! How Much is a Hotel Room in Tamworth? Hotels in Tamworth start at AU$113 per night. Prices and availability subject to change. Additional terms may apply. It was spacious and comfortable- great kitchen, very comfortable bed- wonderful that a one bed apartment had 2 toilets- very convenient. Bathroom was nice & had a good balcony too. Good location, neat, clean, in good condition. Friendly and helpful staff. If I was nit-picking, it can be heard when in some other room the shower is used or bath water is let in, which happed once, so no real issue. Otherwise quiet, couldn't hear anything else. Pillows could be better, but I am a special case for pillows anyhow. Yes, one more little one: The aircon ineth master badroom made some clicking noises. But that could easily be removed with maintenace and is no general issue, I am sure. Otherwise really good. We'd stay again if in Tamworth. Staff are always extremely friendly and helpful. They recently were accommodating with our laundry requirements and assisted us over the Easter Break when most shops were closed.